I’m not much of a breakfast eater, in fact, I rarely eat breakfast. I find when I wake up I don’t feel like food. It’s not till I’m driving to work that the rumbles begin, then I regret my decision. This happens pretty much every morning. Growing up I didn’t eat much breakfast either, besides picklets. Every now and then I would eat eggs, but I hated toast and cereal. I don’t think Italians eat much in the breakfast department. When I was in Italy, I noticed they always have a coffee and a brioche - that’s more like morning tea! Well now days every Saturday morning I seem to eat a relatively big breakfast, mainly because I’m feeding a boy who then heads off to a rugby game. Well. Last Saturday things got fancy. 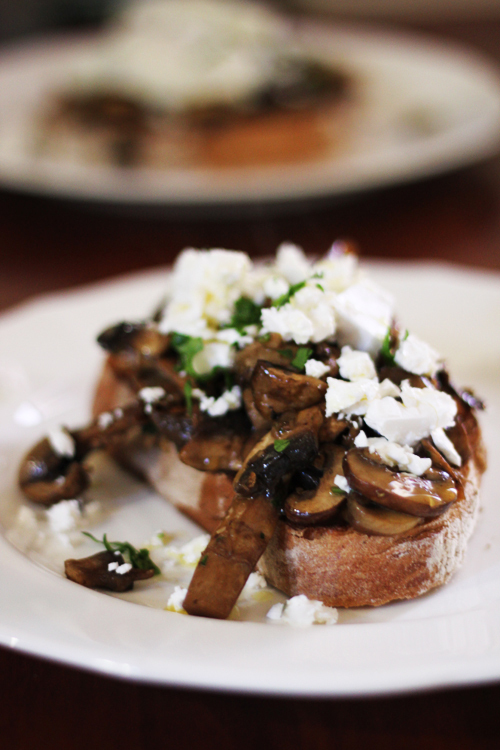 I’ve been eating mushroom bruschetta at a few cafes lately, and I wanted to make it myself. 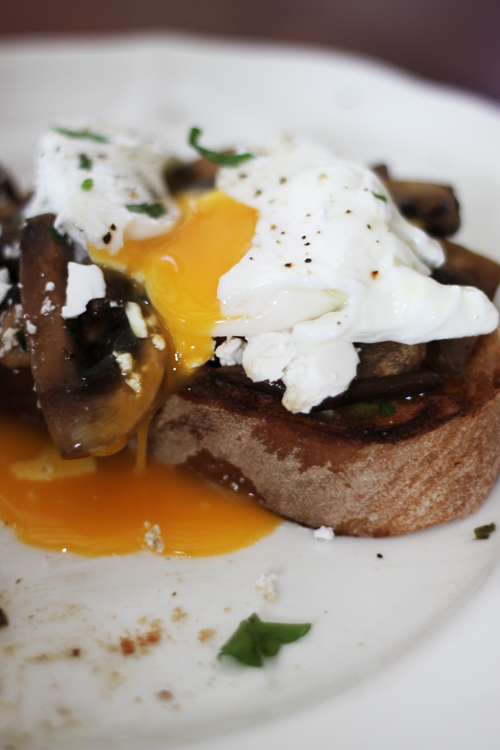 I looked for a simple recipe and came across Bill Granger's Mushrooms on Toast from his book Bills' Food. I tweaked it only slightly to my taste preferences, but the recipe was pretty much spot on. Mmmm... it was good. Really good. Colin poached two eggs and put them on top of his bruschetta, while I left mine plain. The egg yolk slowly dripping down on to the toast may have made me regret my decision. Only just. If using porcini mushrooms, soak in cold water for 5 minutes. In a saucepan over a medium heat, add half the butter, olive oil and garlic and stir. Add the mushrooms and a few tablespoons of water and stir. Add salt and pepper to taste. If the mushrooms absorb all the water and the pan becomes dry, add a little more water. You want to achieve a syrup-like consistency. Cook for about 15 minutes or until the mushrooms are cooked. Add the balsamic vinegar, most of the parsley and lemon zest and stir. Add the remaining butter and stir. 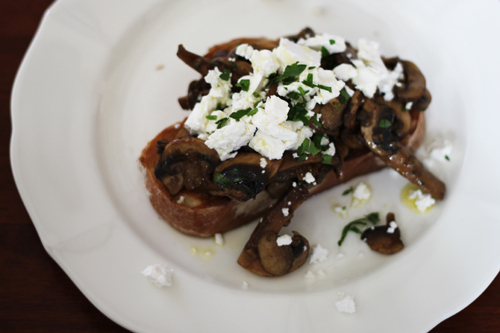 Drizzle the toast with a little extra olive oil, then top with the mushrooms. Crumble the feta on top and sprinkle with remaining parsley and serve.